This post came up on Dr. Nerdlove lately and it brought something to my attention I hadn’t previously ever even heard of: Olivia Munn is a fake geek girl. Apparently. At least that’s what some people apparently believe. This was all news to me. I didn’t know that Olivia Munn considered herself a geek girl, let alone that people would consider her to be faking it. Is Oliva Munn a fake geek girl? No, because there is no such thing. You can’t fake something that has no barrier to entry in the first place. The fact that there even would be such a thing is a foreign concept to me. I guess I come from a time when even geeks didn’t want to be known as geeks, let alone someone that didn’t have to be. When I grew up, you wore your Star Trek shirt knowing it was going to get you beat up. You knew letting that information out branded you somehow, and that you would be looked down upon. There were women in this group too. They were usually social outcasts as we were. They faced the same marginalization we did, if not worse. So I suppose it’s hard for me to understand that there would be a group of people who would fake being a geek. What does a fake geek look like? What makes a person who pretends to nerdiness? I’m trying to decide if such a thing is even possible. Could you wear a Star Trek T-shirt, despite having never seen the show? Say that you love the X-Men, despite having never read the comic book? I suppose that’s about the closest you get. But I doubt that happens very often. A more likely scenario, one I’ve encountered, are closet geek girls. Women who were afraid of the stigma attached. This phenomena I can point to more readily. I recently dated a very beautiful woman (I know, it sounds like I’m bragging, but trust me, she turned out to be THE WORST). She grew up in high society in a large U.S. city, took martial arts and played roller derby, and was a fashionista. Her secret: She fell in love with Dungeons and Dragons. She told me, primarily because she knew I tended toward geekitude. I asked her how she came to play in the first place, and it turned out some friends she met through marijuana circles invited her to play once, and she tried it because she was bored. She said she loved it, because she could wear sweats all weekend, get high and chill without the social pressures she faced in the club scene. She felt more comfortable in that place then just about anywhere else in her life. She described it as a secret life – she never would have told her clubbing friends any of that. They would have ridiculed her, she believed. In fact, publicly, she probably would have ridiculed someone like herself. So, was she a fake geek girl? Of course not. She really did genuinely enjoy playing. Maybe she was afraid to share that fact with others, but her enjoyment was for real. So we come to Olivia Munn. My first thought when learning about Munn was that, huh, women who looked like that didn’t like geek stuff when I was growing up. But that’s not true, as Munn and my ex demonstrate. A more accurate way of looking at it, is that most women who were into geek stuff didn’t want to admit it. Now days more women are admitting to loving all things nerditudinal, because the stigma has largely disappeared. And that’s a good thing. That’s what I think people wanted all along. Geeks should be happy to county Munn among us as a fellow geek. She’s a talented actress (I feel in love with her on The Newsroom and New Girl) and gorgeous. I decided to do a search of “Olivia Munn Fake Geek Girl” just to see what would pop up. Two things themes emerged: The ramblings of grammatically challenged neckbearded MRA guys, and self-righteous feminists talking about gatekeeping. The neckbeards are amusing – they make vague points and ad hominem attacks on Munn, without really pointing to anything specific. I thought perhaps I would gain some insight into how this whole thing came about. Nope. Just a bunch of mindless, and poorly spelled, drivel. It seems to be impossible for some people to resolve that an attractive person could also like nerdy stuff. But the main point is that THERE IS NO BARRIER. There’s no test. If you want to call yourself a geek, you can. That’s for anyone. And frankly, isn’t that what we always wanted? It’s completely socially acceptable to say you love Star Wars, or to have board games nights, or be into D&D. There was a time when you wouldn’t dream of bringing it up on a date. Now you can talk about it freely. Now you can bond over those shared interests. I think that’s just fantastic. So let’s get rid of this fake geek girl thing. There’s no such thing, and even if there were, why would it matter? It doesn’t. The fact is, the geekdom has always been an open kingdom with a benevolent ruler ready to accept you from wherever you come from. Let’s remember to keep it that way. Previous Get a free kindle book Friday and Saturday: Robot Awareness Part I! 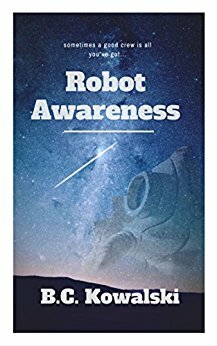 Next Robot Awareness Part I ebook is free today on Kindle!